These days, with my left hand starting to lose it's feeling, I tend to avoid playing much at all. Now and then I attempt to force myself to rise to my past glory, only to prove that my better days are truly behind me. Still what can I do? I'm addicted to playing music, you see. Last week I tried to think of something that I'd want to record that I hadn't already done. The wonderful, sunny whether got me thinking along a summer theme and the 'Summertime Blues' came to mind. 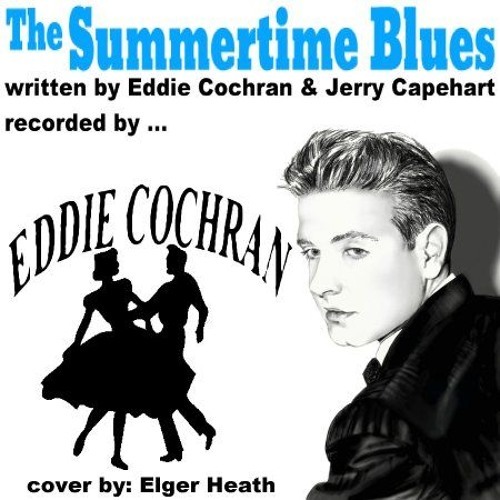 Co-written by Eddie Cochran and Jerry Capehart, it was originally recorded by Eddie Cochran. It's a lively Rock-a-billy number about the frustrations of teenage life and love in the throws of youth. Though recorded by many other artists it is probably best remembered as a hit for Alan Jackson in 1994. This is NOT an easy piece to preform and I've never done it, seriously, before but I couldn't think of a more suitable number for the time of year so here is my effort to cover the 'Summertime Blues'.